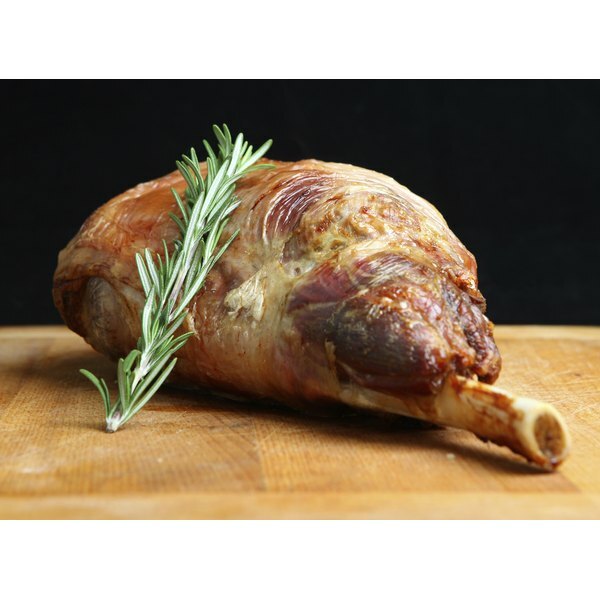 Enjoy roast lamb rare, medium or well-done. When a leg of lamb is divided in two, the upper part is called the sirloin while the lower part is the shank. The sirloin is the tenderest meat, but some people prefer the shank. You can ask the butcher to debone the joint, and to roll and tie the meat. This makes carving easier, although some cooks believe that a bone-in joint has better flavor. Lamb is a fatty meat. You can trim off the fat before cooking, but this can make the meat more apt to dry out. Compromise by cutting off and discarding the fat at the carving stage. Preheated your oven to 400 degrees Fahrenheit. Peel about a dozen medium-sized cloves of garlic, using a sharp knife. Prick the skin of the lamb joint with the point of a sharp knife, making regularly spaced holes large enough to accommodate the cloves of garlic. Push the garlic cloves into the holes so they are entirely embedded in the meat. Massage a thin coating of olive oil into the skin. Place the lamb on a rack in a roasting pan, and cover it loosely with aluminum foil. Pour about 1 cup of water or white wine into the pan. Put the lamb in an oven. Remove the foil after 60 minutes, and lower the heat to 350 F.
Test the lamb for readiness by sticking a metal skewer into it after about another 30 minutes of cooking. If you like your lamb rare, remove it from the oven when pink liquid still drips out after pricking with the skewer. For a well-done joint, cook it until the juices emerge with no color. 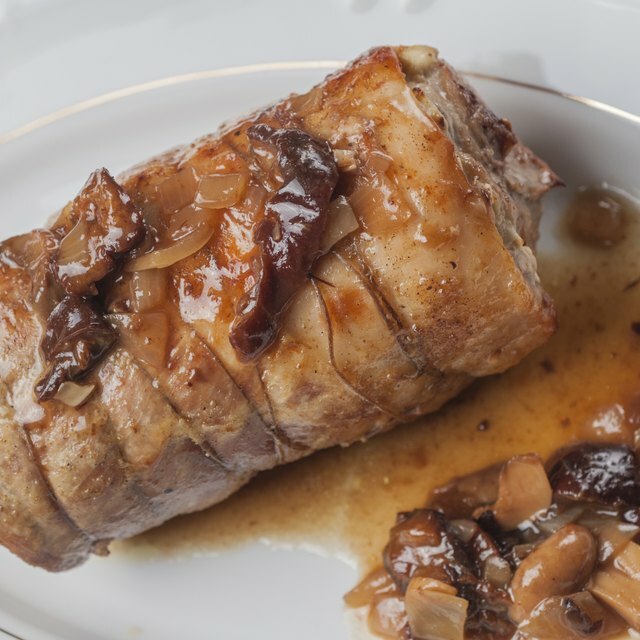 As a rule of thumb, medium-cooked lamb leg requires about 30 minutes per pound. Drain off the fat on top of the liquid in the bottom of the pan and use the remaining liquid as gravy. Add more white wine or water to the liquid as you heat it gently in a small pan on the stove. After the initial 30-minute cooking period, add vegetables to the bottom of the pan, such as shallots, carrots and parsnips. Add a couple of sprigs of rosemary to the vegetables for an even tastier dish. Check the pan every 20 minutes or so to make sure there is still liquid in it. Add more white wine or water if it’s low.